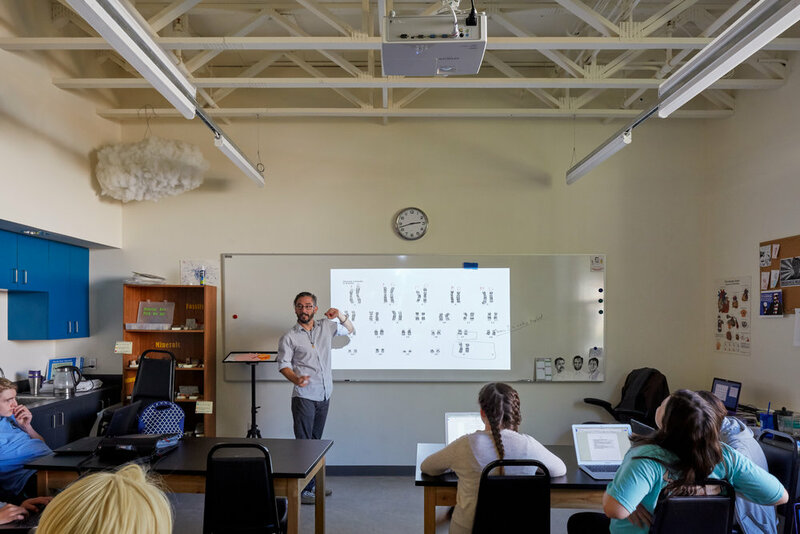 Griffin School is a college preparatory high school in Hyde Park with a diverse, liberal arts curriculum and a creative student body. 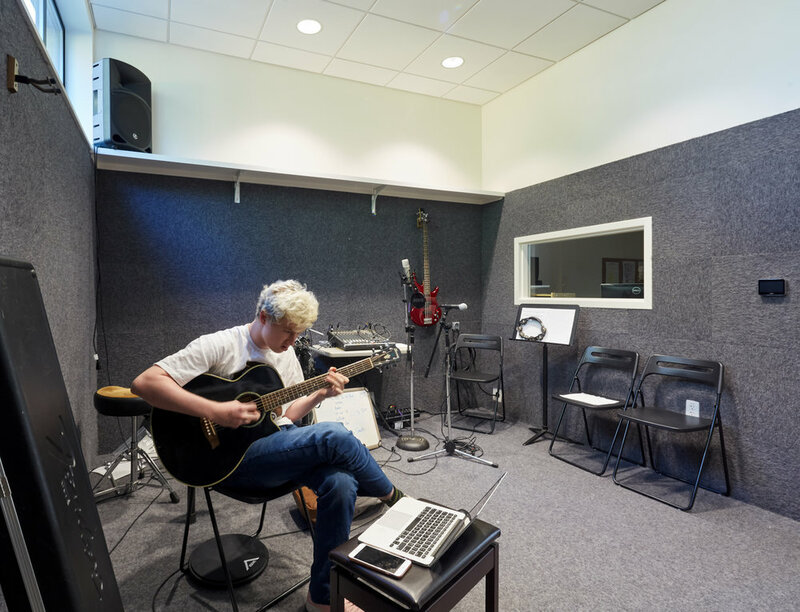 For many years their campus in a residential neighborhood had consisted of a repurposed church, a house converted to classrooms, and a small workshop. 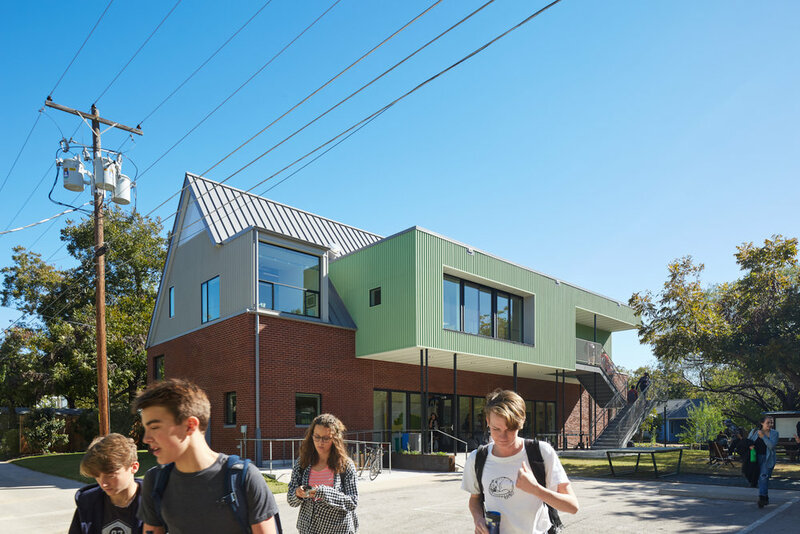 To accommodate growing enrollment and create a campus that embodies their core values, Griffin School added a new two-story classroom building to this existing ensemble. 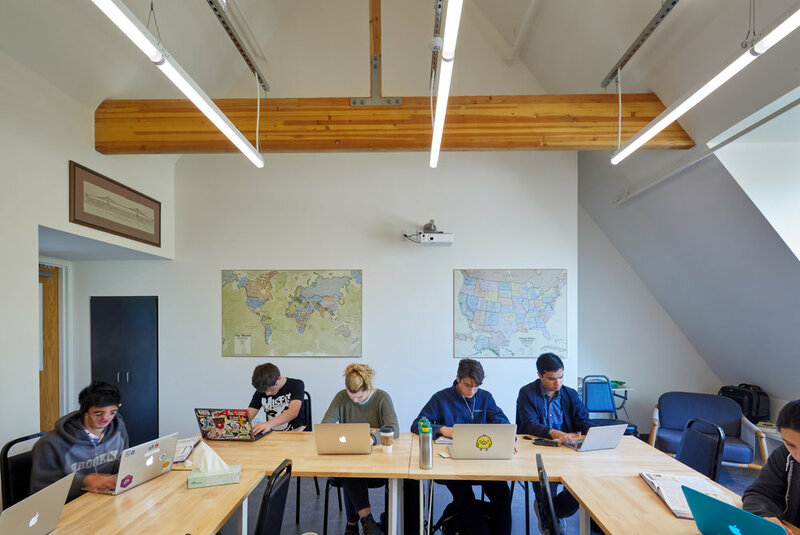 A master planning project goal was to transform the eclectic assemblage of structures into a cohesive, vibrant campus by uniting them around a central quadrangle. The new building forms the enclosing northern boundary of this courtyard. 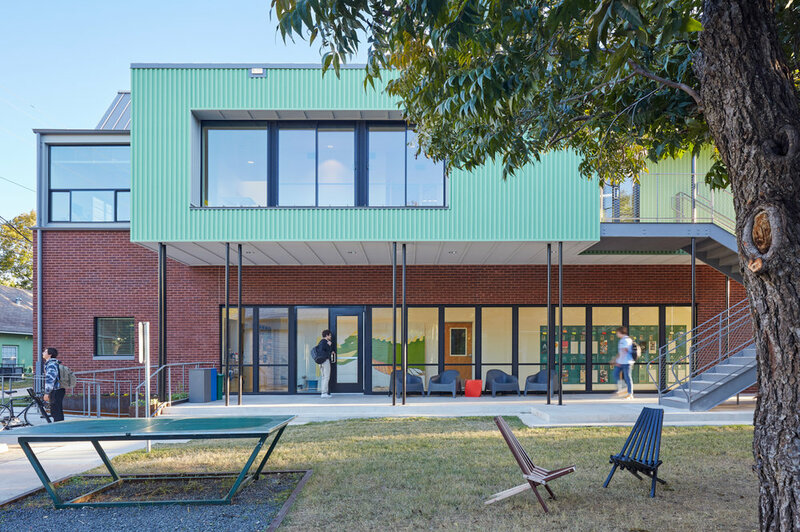 Daily movement of students and faculty–class changes, instrument practice, Ping-Pong, basketball, lounging, shop projects, and outdoor classes–are all showcased within this new, concentrated public space. These highly visible activities form the beating heart of the campus. 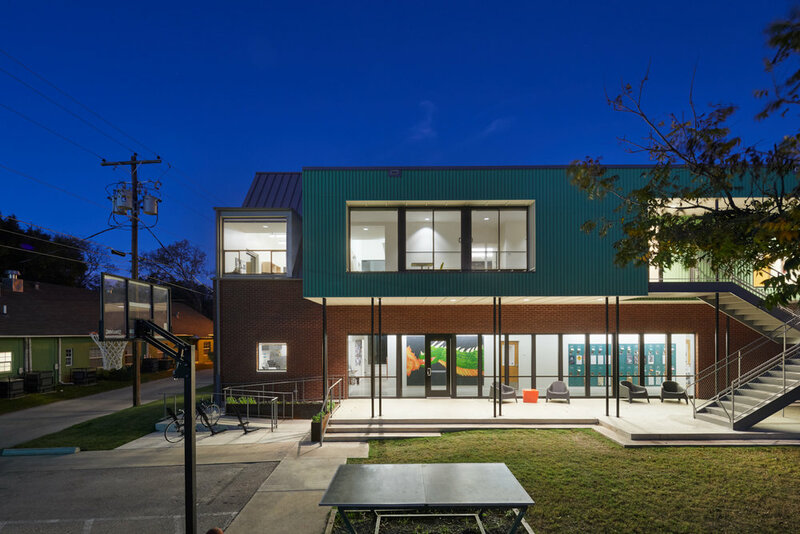 The new building enhances the social character of the school by encouraging engagement. In a nod to Texas vernacular buildings, a generous, deeply shaded south-facing porch opens up to the courtyard, providing a comfortable place to shelter from the summer heat and bask in the winter sun. 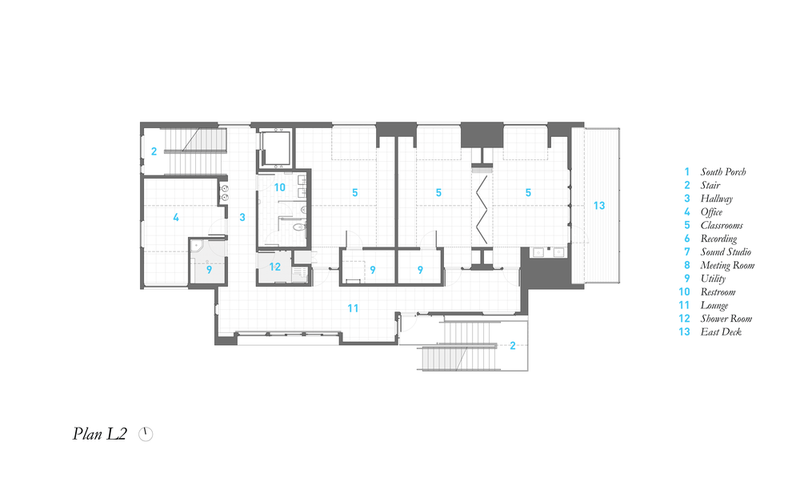 Farther into the building, the central corridor opens up visually to the porch and courtyard beyond through a long expanse of windows. Finally, an exterior stair protruding into the courtyard offers an elevated perspective of the campus. 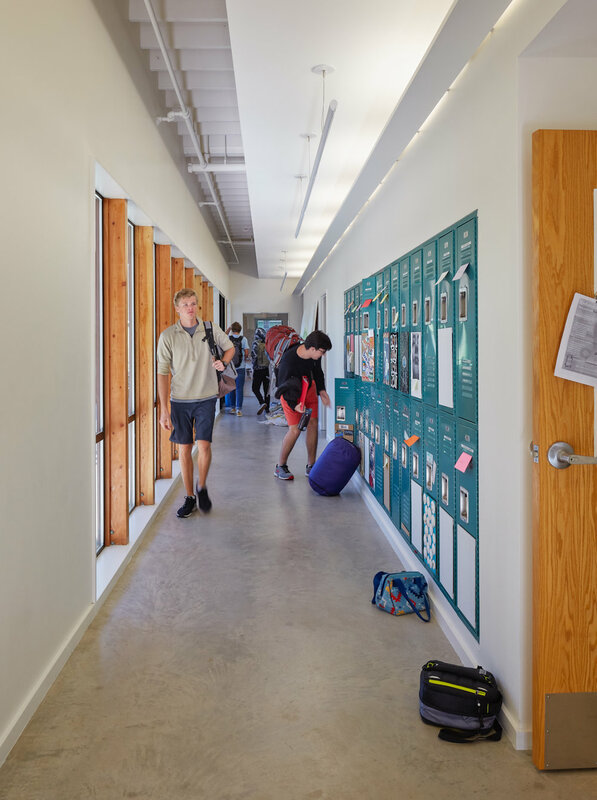 Throughout the building there are unexpected moments of visual connections to specific places in the campus. 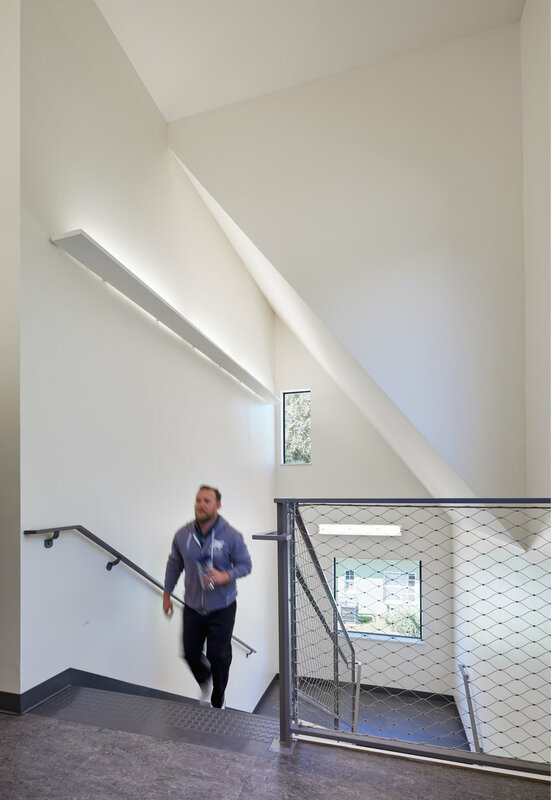 This layered connection forms a highly social experience of movement through, around, and between buildings. 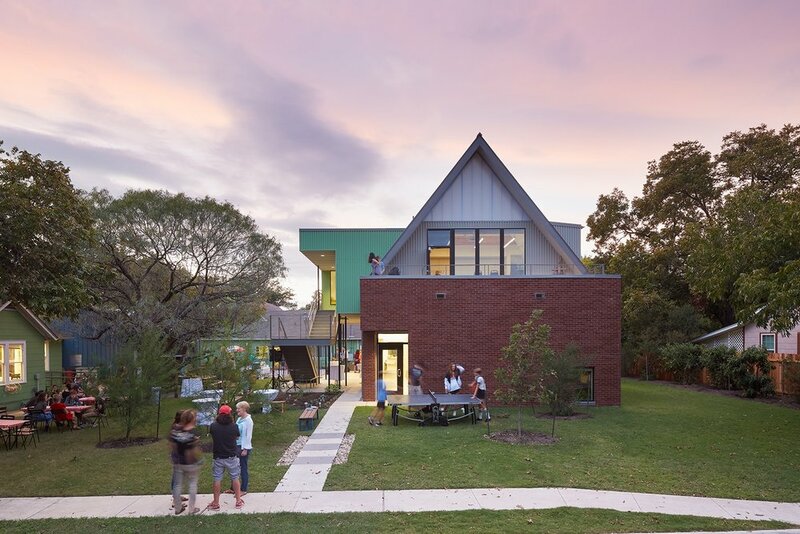 Griffin School is an engaging and interactive community, and the new building strives to cultivate and inspire the creative aspirations of the school. Modest materials are used in surprising ways to sculpt light, space and movement into a rich, tactile experience. 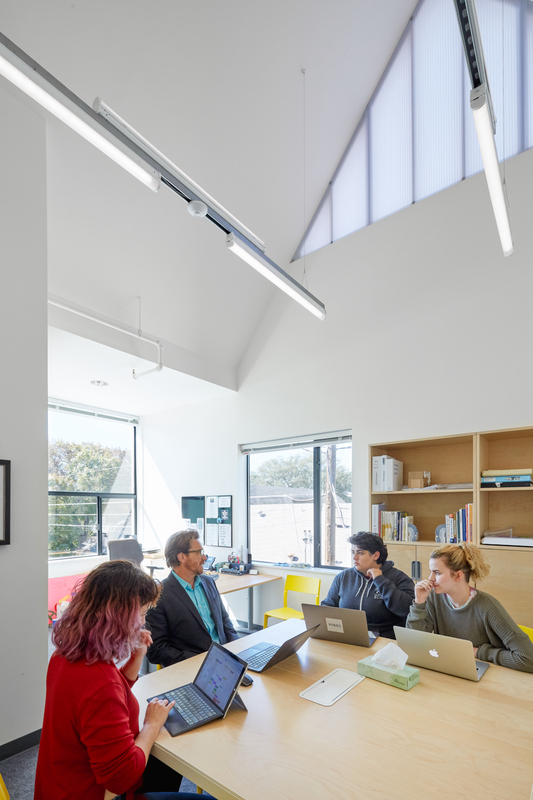 On the ground floor, exposed trusses and wall framing reveal the structural bones of the building, adding contrasting texture to expanses of clean white walls and exposed concrete floors. The upper floor is contained within the sloping underside of the gable roof and gives the intimate feeling of being inside the attic of a house. 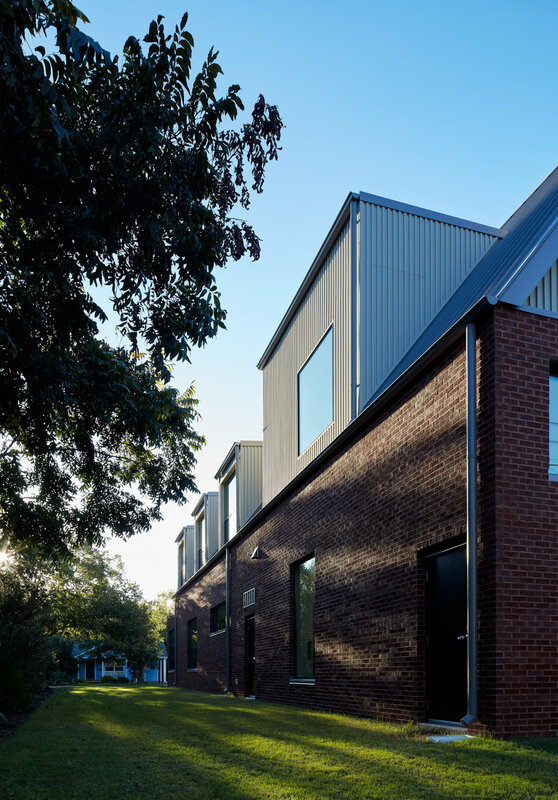 Rather than the straight-laced character of a typical school, the Griffin School building has the airy roughness of an art studio or workshop. 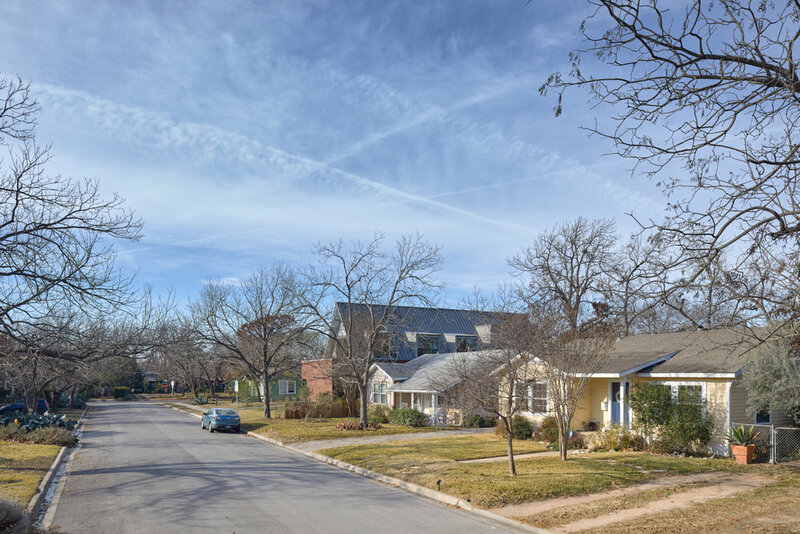 The new building fits into its residential neighborhood context through a combination of aesthetic and formal gestures. 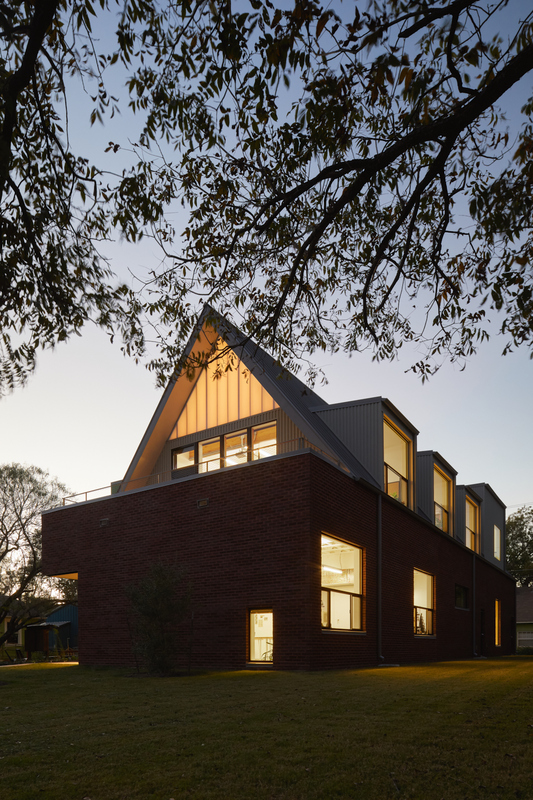 The basic form of the building draws on traditional residential elements: a brick base with an iconic gable profile on top. 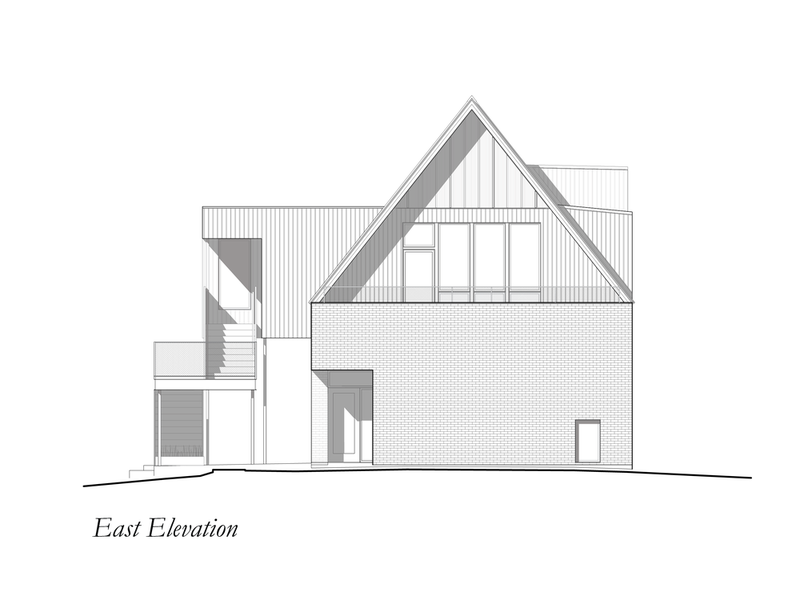 The second floor is contained entirely within the gable, which allows the eaves to be lowered closer to the ground to effectively reduce the building’s scale. 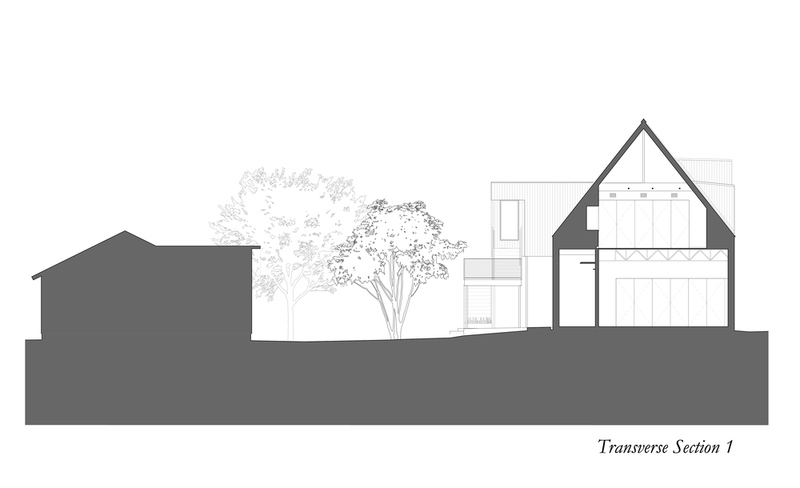 The gable end is oriented towards the street and stepped back on the second floor to present the smallest face of the building to the neighborhood. Light is introduced to the second floor through dormer windows that echo traditional house construction.